The Web Analytics module allows you to track and analyze website visits, page views, file downloads and other metrics of the website. The module runs in the background of the website collecting all statistics information. The Web analytics module can be accessed in CMS Desk -> Tools -> Web Analytics. As you can see in the screenshot below, when you select a report on the left, the corresponding statistics are displayed on the right. You can choose the year, month, week and day. The screenshot shows a detailed report with graphs and a table. Every minute, a new file is created. A scheduled task reads the closed files every minute (or other scheduled interval) and imports the data into the database. This data is then displayed by means of the reports defined in the Reporting module. The name of the scheduled task is Process analytics log and you can control its status and settings in Site Manager -> Administration -> Scheduled tasks. The Web Analytics module is disabled by default. You can enable it in Site Manager -> Settings -> Web Analytics by checking the Enable Web Analytics check-box. Please note that the Web Analytics module requires that the Modify permission for the ~/app_data folder on your disk is granted to the ASP.NET account (see the Disk permissions problems chapter for names of the account under various operating systems). The Web Analytics module tracks only content and events related to pages managed by Kentico CMS. It doesn't track other content, such as html files or media files (jpg, gif, etc.) that are not served by the CMS. All the events are stored in temporary files and need to be processed on regular basis, by a scheduled task. Please note that there can be a delay between the event (such as page view) and its displaying in the reports. 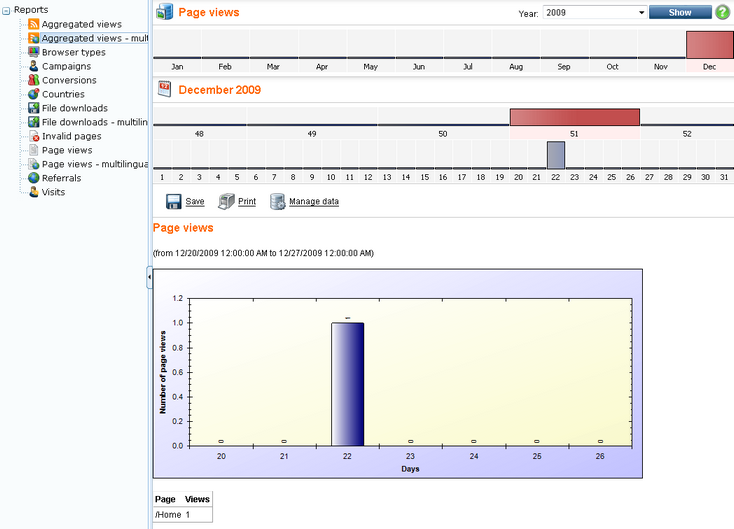 • To learn with which pre-defined reports the Web analytics module comes, please refer to the Available reports topic. • To learn about the campaign tracking support in the Web analytics module, please refer to the Tracking marketing campaigns topic. • To learn about the conversion tracking support in this module, please refer to the Tracking conversions topic. • To learn how to configure the module, please refer to the Configuration options topic. • If you would like to learn about the security possibilities of the module, please refer to the Security topic. • To learn how to create custom reports, please refer to the Creating custom reports topic.